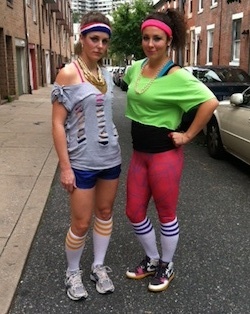 I teased my hair, slapped on a sweat band, and wore gold-ringed tube socks for the Totally Awesome 80s Run 5K. And it was, like, totally awesome. By Emily Leaman·	 8/27/2012, 3:02 p.m.
That's me on the left and Abby on the right, pre-race. Totally awesome, right? I’ve never run a race with the express goal of not smudging my makeup. Come to think of it, I’ve never run a race where I’ve worn a smidge of makeup at all. But when you stay up late shredding a T-shirt as part of your costume for said race, and wake up extra early to slather on an ungodly amount of eyeliner and teal eyeshadow, I guess it makes sense. On Saturday, that was my No. 1 goal: to cross the finish line of the Totally Awesome 80s Run in Pitman, New Jersey, without having gobs of mascara and eyeshadow running down my face. If you know me in real life, you know this is a very difficult task. 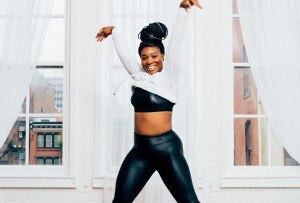 One, because I sweat—a lot. And two, because I have a hard time competing in a race and not, well, racing. But considering I hadn’t trained all that well for this particular 5K and I happened to come down with (yet another) summer cold the day before the race, I figured it was a wise course of action. You know, for both my health and my eyeshadow. Priorities. Luckily, my intrepid running buddy (a.k.a. 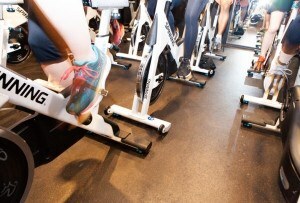 Be Well’s Project Revamper), Abby McKenna, had the same goal as me. Actually that’s not true—she had one other, too: to win the prize for best costume. We accomplished the former, but not the latter. 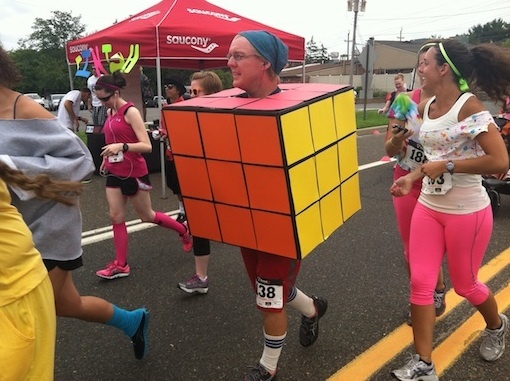 But given the competition in the costume department, I’m not all that upset about it: I may have shredded a T-shirt and teased my hair within an inch of its life, but someone else dressed up as a Rubik’s cube, people. And he ran in his cardboard costume. Now that’s dedication. The race course itself was pretty flat. Just a few rolling hills to send my cold-induced lungs into a mild mucus tizzy. (TMI? Sorry.) But I stuck with it and completed the out-and-back at a slow enough clip that my makeup didn’t run, yet a fast enough one that I didn’t come in dead last. Win-win. After the race, the real fun got underway. The hundred or so of us that turned out for the race had the option of sticking around afterwards for a live-band-serenaded barbecue at Carolina Blue Smokehouse and Taproom. We had loads of fun downing platefuls of pulled pork and pasta salad (but not Abby—she’s still revamping, believe it or not), and singing Madonna and Bon Jovi hits at the top of our lungs. The top finishers got their choice of 80s DVDs for prizes (I mean, what could be more appropriate? ), and there was even a Running Man contest that some dude named Kyle totally killed. Basically, this race was more fun than sweat-fest. Sure, there was a 5K. And certainly, some folks crossed the finish line with impressive times—maybe even PRs. But I think most of us shared a common, if unspoken, goal: to not ruin our makeup. And that’s all we Totally Awesome 80s runners could really ask for. >> Click over to Page 2 for more photos!